Unwind this Holy Month of Ramadan at Arabian Courtyard Hotel & Spa, located in the heart of the ancient cultural district and diplomatic enclosure of Dubai, where families and friends can cherish relaxing evenings while breaking fast at Pharaoh Café & Restaurant. 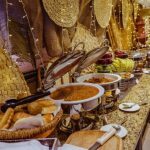 The Ramadan Iftar buffet, priced at AED89 per person, promises an evening of great food, good company and a comfortable venue where the grandest memories can be created while indulging an array of traditional salads, fresh Indian and Pakistani flavours along with grill, kebabs, tikka and batair. The restaurant will have live cooking stations for shawarma and pakora such as onion pakora, chilli pakora, falafel and spinach fatayer. Refreshing Ramadan juices and local beverages will be complemented by a selection of Arabic, Oriental and International desserts such as the all-time favorite’s basboosa, umm ali, badam kheer, fruit salad and jelabi. 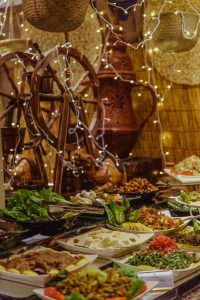 Pharaoh Café & Restaurant has comfortable seating and is decorated in traditional set-up where individual, couples, families, groups and even corporate can plan their celebration of the holiest season of the year. A special rate of AED65 per person is extended to groups of more than 10 when dining at the restaurant during Ramadan. The Iftar buffet is open from 7pm until 11pm during the whole month of Ramadan. The rates are inclusive of 10% municipality fees and 10% service charges but are subject to 5% VAT. For reservations and group bookings, please call +971 4 351 9111/ 050-4503794 or send an email to fbd@arabiancourtyard.com.